1. Preheat oven to 325 degrees F. Spray a 6-hole muffin pan with cooking spray. 2. Sift together flour, sugar, baking powder, and salt. Add the egg yolks, oil, orange juice, vanilla and almond extracts, stirring together until just blended (dont' worry about lumps). 4. Using a spatula, fold in the egg whites carefully into the batter in 3 separate additions. Ladle batter into the muffin pan, filling each well to the top. 5. Bake for 25 minutes, until tops of cakes spring back when lightly pressed with fingertips. Remove immediately from oven. 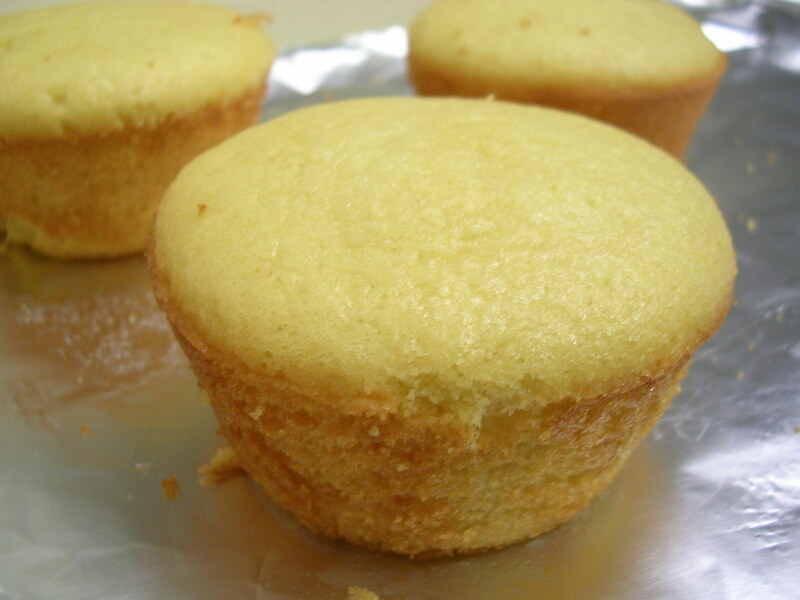 Slide a knife around the edges of the cakes and flip over the muffin pan to release the cakes onto a cooling rack. They will have a golden brown skin around the edges, and you can either keep them for texture and color or trim it off for aesthetic appeal – I tried both and they both look and taste great. 6. While the cakes are baking, prepare the instant pudding according to directions and chill in the fridge. For the chocolate sauce topping, melt butter in the microwave, then stir in chocolate chips to melt. If they don't all melt, microwave for an additional 20 seconds and stir well. 7. To assemble dessert – slice up cakes into three layers. 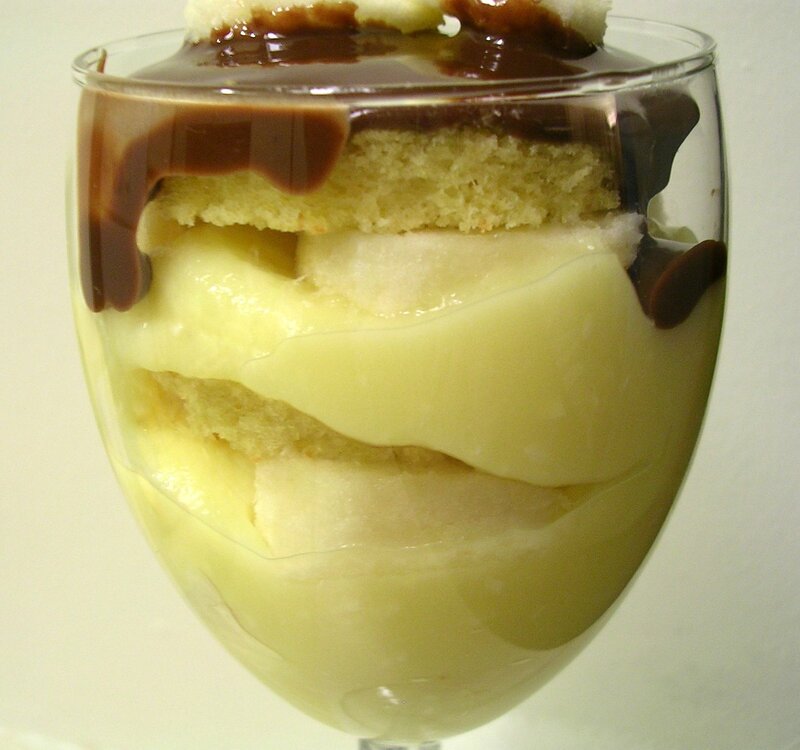 In a parfait glass or a goblet, alternate spoonfuls of pudding, banana slices, and cake layers, ending with a cake layer on top. 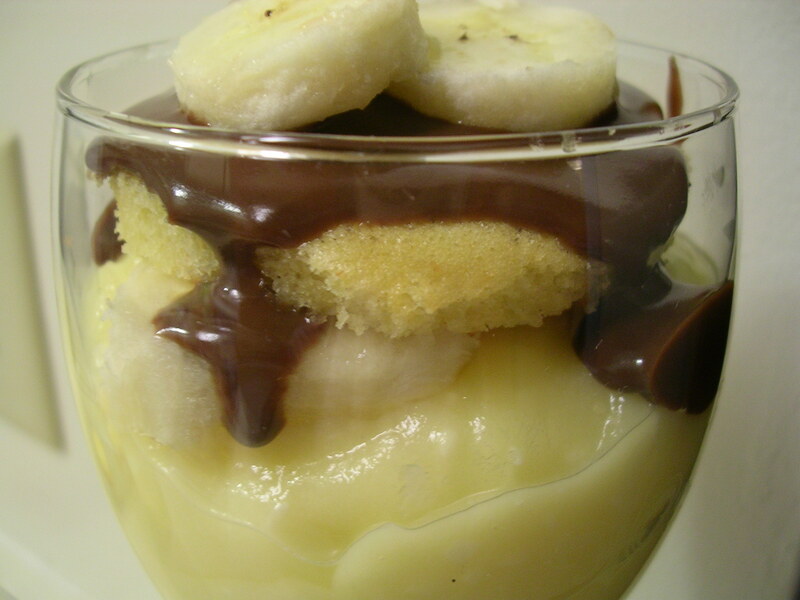 Drizzle with chocolate sauce on top and garnish with banana slices. Serve immediately or chill until needed. Enjoy! This entry was posted on Sunday, April 20th, 2008 at 9:32 pm	and posted in American, baking, desserts, recipes, Uncategorized. You can follow any responses to this entry through the RSS 2.0 feed. Fresh Out of the Glass » eat, live, love, laugh, cry and be happy!